Habitat and ecology: Low dry rocks along streams. 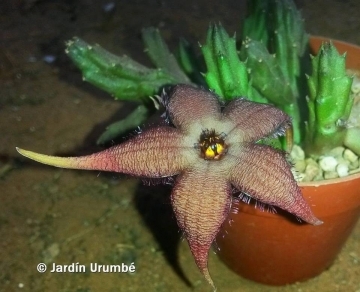 Stapelia schinzii A.Berger & Schltr. 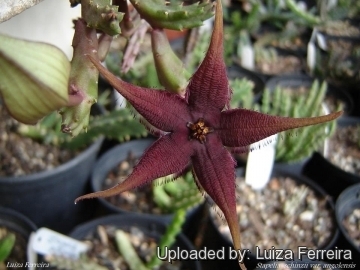 Description: Stapelia schinzii var. angolensis is known by its very handsome and highly curious dark red to maroon flowers with hairs along the edges of the petals. It is similar to var. 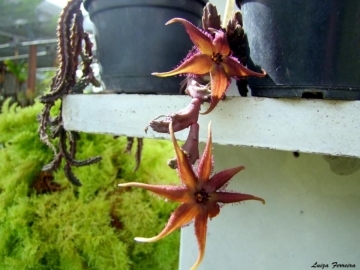 angolensis, but has generally smaller flowers ( only about 8 cm in diameter) borne on more slender, scarcely toothed stems which adopt a creeping habit. This species and occasional species in other genera (Orbea ciliata, and Stultitia cooperi to name only the most striking) present one of the most fascinating phenomena of plant life, they have clavate and strongly vibratile hairs which form a fringe along the edge of the corolla lobes. These hairs hardly remain still and start trembling in the slightest breeze, possibly attracting insects. Stems: The stems are creeping, green, mostly purple-mottled and up 6-7.5 cm long, 1.5 cm across, with winged angles, hairless or minutely roughened at first, tubercles decurrent, with a minute tooth at the base of the ultimately marcescent tips. Leaves: Rudimentary, about 5 mm long, ovate, long-attenuate, delicately roughened, stipular rudiments yellowish. Flowers: Usually solitary (a second bud aborting), borne on lower half of stem. Peduncle robust, glabrous. Pedicels 5 6 cm, delicately roughened. Sepals 5 8 mm, mostly glabrous. Corolla c. 8 cm cm across, inside hairless, greenish or reddish-brown beneath many close, purplish delicate wrinkles. Limb shallowly concave. Lobes ovate, long acuminate, 3.75 - 8.8 cm long, often caudate, outside more or less glabrous, inside glabrous, fringed with vibratile, purple, club-shaped glandular hairs. 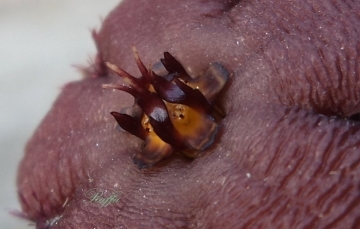 Outer corona-lobes dark red or black, usually oblong, c. 4 mm long pointed, sometimes ovate and mucronate, diverging. Inner corona-lobes c. 8 mm high, with erect 3-angled, inner horn and erect, free outer wing as long as the apical append age broad, narrowly ovate-pointed or rectangular, ob-tuse, irregularly dentate, free. Pollinia brownish, 1 x 0.5 - 0.6 mm. Stapelia schinzii var. angolensis Kers: has generally smaller flowers borne on more slender, scarcely toothed stems which adopt a creeping habit. Distribution: Angola. Stapelia schinzii var. bergeriana (Dinter) L.C.Leach: has an aberrant smooth shiny corolla. 8) Bruyns, P.V. 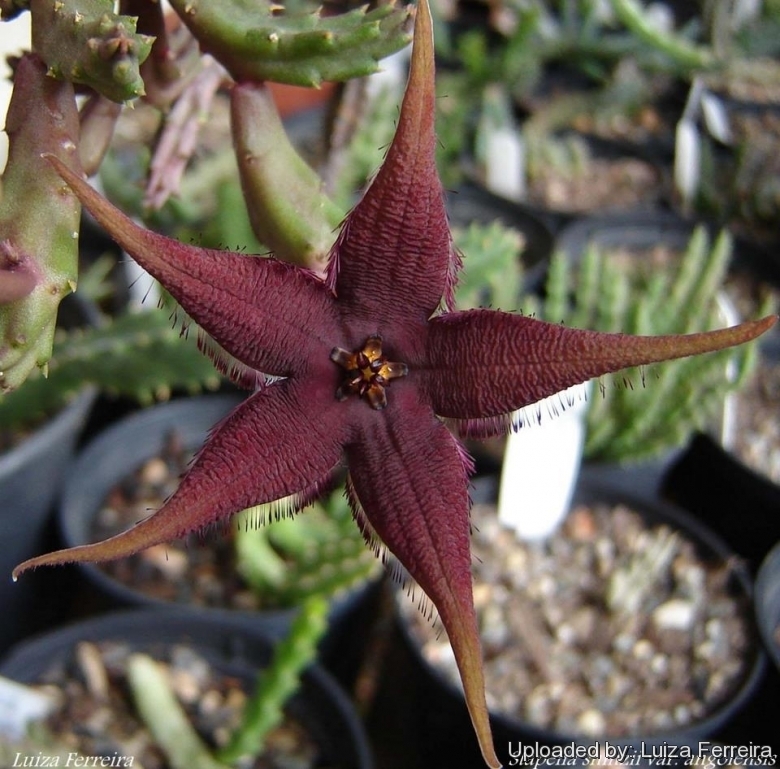 “Stapeliads of southern Africa and Madagascar” vol. 1. Umdaus Press, Hatfield, Pretoria. 2005. 9) Court, D. “Succulent flora of southern Africa” revised edn. Balkema, Rotterdam. 2000. 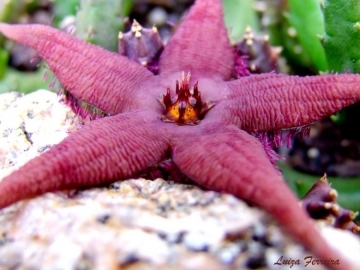 Cultivation and Propagation: Stapelia schinzii is a very unusual, xerophytic plant adapted to dry soils. It is very suitable for a hanging pot. Growth rate: It is a somewhat slow growing Stapeliad that will make large clumps given the best conditions. Most plants will offset readily, and clumps can be produced in a few years. Soils: It likes very porous mineral cactus mix soil, pH 7,5 to 8,5 (mildly alkaline), but can become too elongated if compost is too rich. Watering: It needs regular watering, especially during the hottest summer days; provide also some light watering if the green house temperatures in winter are elevated. Either excessive or very scarce watering can induce rot. Frost Tolerance: For safe cultivation winter temperatures must be kept over 10° C, but it can withstand winter night-time temperatures down to about 5°(or less) Celsius for short period. Freezing temperatures are often fatal. In the rest period no high atmospheric humidity!! Sun Exposure: Best for half-shade but grow well in full sun and full shade too. Tends to bronze in strong light, which encourages flowering, but is likely to suffer from sun scorch or stunted growth if over exposed to direct sunlight during the hottest part of the day in summer. Diseases: This species is relatively resistant to cryptogamic diseases than others and is quite resistant to the “Balck spot” disease of Asclepiads. Rot it is only a minor problem with Stapelia schinzii if the plants are watered and “aired” correctly. If they are not, fungicides won't help all that much. Uses: It is an excellent plant for container growing. Cascading, clustering, great for a hanging display. Stems may possibly become purple and limp in winter, but revitalize in early spring. It always looks good and stays small. It look fine in a cold greenhouse and frame or outdoor in a rockery. Propagation: Seeds and cuttings. Cuttings will root only in hot weather. Cuttings must be kept very dry to root. Seeds germinate readily if they are sown when fresh.